Arctic foxes are monogamous and usually mate for life. Fully grown arctic foxes weigh from 6 to 10 pounds. They average 43 inches (109 cm) in length including the tail, which is about 15 inches (38 cm) long. Their short legs and body, short ears, and dense winter fur give them a stocky appearance compared to their slightly larger relative, the red fox (Vulpes fulva). Arctic foxes molt twice each year. Both blue and white color phases occur, with the blue phase more common on the Aleutian and Pribilof Islands. 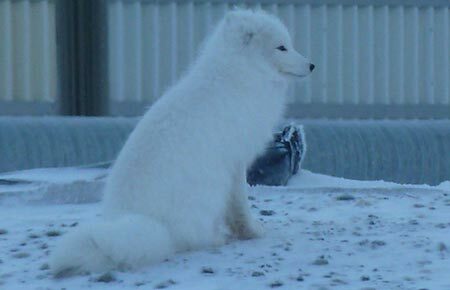 The white color phase is more common in northern populations. Young of each color phase may occur in the same litter. The white foxes begin to shed their long winter fur in early April. By late June the face, legs, and upper parts of the body are covered with short, brown summer fur. The fur of the lower sides and abdomen is yellowish-white. The change to winter pelage occurs in September and October. By November the luxurious white winter coat is complete. Foxes of the blue phase remain dark or charcoal colored year round, but are somewhat lighter colored in winter. Newborn arctic fox pups of both color phases are covered with short velvety dark brown fur. This fur lengthens and becomes lighter, especially on the flanks, after the pups reach two weeks of age. The contrast between the back and belly increases as the back darkens during their first three months. Blue phase pups acquire their characteristic dark color by the time they are two months old. Arctic fox pups are born in dens excavated by the adults in sandy, well-drained soils of low mounds and river cutbanks. Their breeding range in North America is mostly on the coastal plain and coastal regions of continental Canada and High Arctic islands. Most dens have southerly exposure. They extend from six to 12 feet underground. Enlarged ground squirrel burrows with several entrances are often used as dens. Mating occurs in early March and early April. Gestation lasts 52 days. Litters average seven pups but may contain as many as 15 pups. Arctic foxes are monogamous in the wild. Both parents aid in bringing food to the den and in rearing the pups. Pups begin eating meat when about one month old and are fully weaned by about six weeks. They first emerge from the den when about three weeks old and begin to hunt and range away from the den at about three months. Family units gradually break up during September and October. During midwinter, foxes lead a mostly solitary existence except when congregating at the carcasses of marine mammals, caribou, or reindeer. Arctic foxes attain sexual maturity at nine to 10 months, but many die in their first year. In summer, arctic foxes feed primarily on small mammals, including lemmings and tundra voles. Foxes denning near rocky cliffs along the seacoast often depend heavily on nesting seabirds such as auklets, puffins, and murres. When food is plentiful, it is sometimes cached among boulders and in dens for later use. Arctic foxes are omnivorous, and sometimes eat berries, eggs, and scavenged remains of other animals. Many foxes venture out onto the sea ice during winter to feed on remains of seals killed by polar bears. Arctic foxes may move long distances over sea ice. A fox tagged along the coast of Russia was captured near Wainwright, Alaska a year later. Arctic foxes are nomadic and travel great distances across their range, usually in a family group. 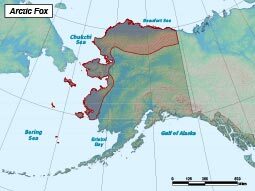 In Alaska, the arctic fox migrates seaward in fall and early winter, and will reverse movement in late winter and early spring. Studies have documented long-distance movements of several hundred kilometers. The arctic fox is found in treeless coastal areas of Alaska from the Aleutian Islands north to Point Barrow and east to the Canada border. They prefer tundra habitat, usually near rocky shores, and have been observed ranging far out onto pack ice in winter. They will commonly use dumps in northern Alaska. When inactive, the arctic fox uses underground dens in a bank or hillside, or may tunnel into a snow bank in the winter. They prefer sandy soil along riverbanks, hillocks, and occasionally talus for denning. The population trend is unknown, but in most likely stable. Foxes are common, sometimes abundant, with populations fluctuating considerably in relation to prey density. Foxes are being eliminated from islands they were introduced to for fur farming. Arctic fox populations rise and fall with cyclic changes of their prey. When food is scarce, foxes raise smaller litters. Rabies is prevalent in most populations, and outbreaks occur periodically in most populations. In areas where people hunt and trap foxes, human harvest is an important cause of mortality. Arctic foxes are found in the treeless tundra extending through the arctic regions of Alaska. Small mammals, including lemmings and tundra voles, nesting seabirds such as auklets, puffins, and murres, sometimes berries, eggs, and carrion.